Find out if your menu meets healthy food and drinks guidelines, by getting it assessed by the Healthy Eating Advisory Service. Long day care services can use FoodChecker to plan healthy menus online according to the Victorian Menu planning guidelines for long day care. You will receive a detailed report highlighting areas where the menu meets the guidelines, and specific recommendations to help you make healthy changes where needed. FoodChecker is currently the only menu planning tool that is based on the Victorian Menu planning guidelines for long day care. The Victorian Government recommends that Victorian long day care services use the Healthy Eating Advisory Service’s FoodChecker to plan their menus. Victorian long day care services that are registered with the Achievement Program and/or Smiles 4 Miles must provide a FoodChecker menu assessment report which confirms that the menu meets these Victorian guidelines. Using feedAustralia will not provide this requirement. To learn more, read this Victorian Government position statement. FoodChecker is the free way to assess your own menu online, and get instant feedback! You can assess one day or one week of your menu at a time to see if it meets the Victorian Menu planning guidelines for long day care. When you assess your menu on FoodChecker you will receive a report containing your results, plus recommendations for healthy changes. You can read your report on screen or save it as a PDF. Once you have made changes to your centre menu, you can reassess it on FoodChecker to see if it meets the guidelines. FoodChecker is currently the only online menu planning tool that will help you plan menus for 0-5 year old children according to the Victorian Menu planning guidelines for long day care. The Victorian Government recommends that Victorian long day care services use FoodChecker to plan their menus. "FoodChecker is awesome! I can assess outside of work hours which is great because I'm always on the floor, and it means I can do it rather than the director." You can also use FoodChecker to plan future menus that meet the Victrorian Menu planning guidelines for long day care. PLUS you can download a copy of your menu to display, and print a shopping list with all of the ingredients you’ll need for the week. Tip: Visit Getting Started for the steps we recommend before assessing your menu, such as doing our free online training and making these priority changes. You can also use the menu planning checklist to quickly self-assess your menu. These steps will help make your menu healthier before using FoodChecker, but you can use it at any time to assess your menu. Are you planning your next menu? Let us assess it now to make sure it meets the Food and drink guidelines for OSHC straight away! 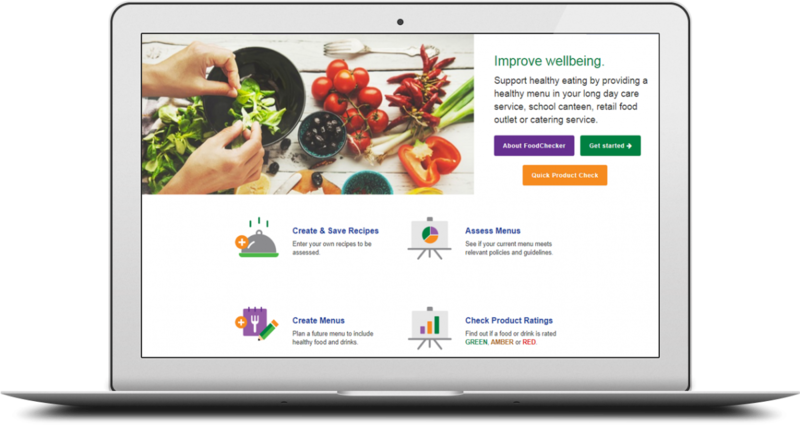 Before having a menu assessment, make sure you have visited the Getting started page to see the recommended steps to having a healthy menu. Read about the guidelines here. Or complete online training or face to face training. making healthy changes to your menu in priority areas. Your current menu, including information about the foods and drinks provided at each meal and snack time. The quantities of all foods and drinks provided at each meal and snack time. For example, the number of whole pieces of fruit on a fruit platter, or the quantity of milk per serve per child. All recipes featured in the menu including the quantity of each ingredient used. Please note: Due to high demand, menu assessments for OSHC can take 4-6 weeks to complete. One of our team will contact you when your submission has been received.